Surface chemistry is what we do. We got our start as an R&D center focused on the development and testing of highly functional detergent additives. We remain an active player in these markets today and offer a specialized line of highly functional surfactants and polymers designed to improve cleaning, solubility, foaming, wetting, surface protection, and emulsification. Our products are especially effective in tough, stressed environments where commodity surfactants and polymers tend to fail. 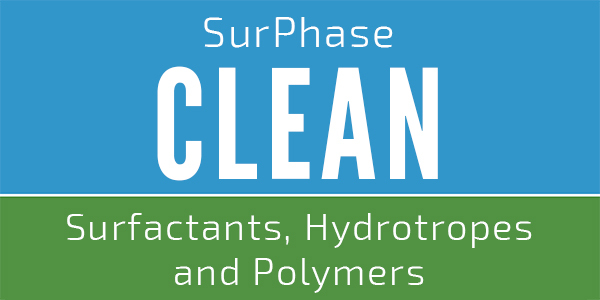 Formulators can count on the SurPhase CLEAN products to provide the functionality that they need, even in challenging high chlorine, high pH, highly caustic, and even strongly acidic products. SurPhase CLEAN surfactants and polymers provide powerful benefits to many challenging cleaning formulations. The SurPhase CLEAN line of products can promote soil removal, wetting, emulsification, surface protection, dispersancy, foaming and foam control, surface modification, and hydrotropic performance in a variety of tough formulations, e.g. low acid, high alkali, and chlorine and peroxide based. In addition to our CLEAN product line, we have very active contract research, applications testing, and claims substantiation efforts underway. We are particularly experienced and proficient at devising methods to evaluate new concepts, and can also perform most standard evaluations. The SCF laboratory is fully equipped to carry out testing and evaluation of many household, industrial, and institutional detergents and cleaners.